On Saturday, I attended the “The Wow Factor” workshop which was pretty interesting. I took a lot of notes. For example, the backlight in photography emphasizes everything. The second workshop “Introduction to Multimedia” was boring. I wasn’t interested and started playing games on my phone to help the time go by. People were leaving before it was over. Then we went up to our room and took an unplanned nap. When we woke up Mrs. Johnson chaperoned one student to the mall. 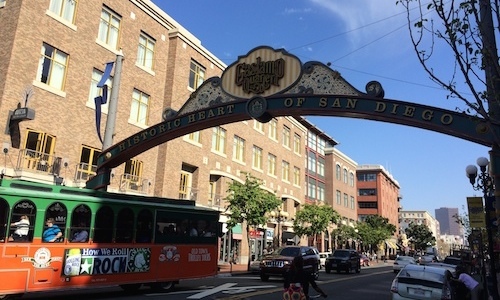 I and another student went to the Gaslamp Quarter which is an area filled with stores, restaurants, and recreational shops. We walked straight up and back 5th Avenue because we didn’t want to turn and get lost. I took a lot of pictures and bought souvenirs for my brother, sister and dog. On April 12, 2014 we went to an interesting workshop called "A Picture is Worth 1,000 Words." The presenter taught us how to aim and focus the camera on the subject(s) we were photographing. Later on we went to the pool and jacuzzi and relaxed. After that we went to our rooms and took a shower and got ready for dinner which we had at the hotel. After dinner we went to our room and watched television and listened to music. The second and last day of the convention was today. Our assignment was to complete two classes at the convention. The classes I took were Photojournalism and Law and Ethics. I learned a lot from the classes but I specifically liked the critiques the news team received. The critic was from Kansas and gave very insightful advice. He gave us a magazine that his school was in charge of. There were sections of the magazine that really related to the student population. There were sections of the magazine that had social media opinions and had opinions of the students’ with their faces showing. The critic also suggested that we have a tangible product of myfnn.com. He also instructed the Photojournalism class which I enjoyed. He informed us about the different elements of a good picture. I tried his techniques later on that day when walking the streets of San Diego and at the mall. The Law and Ethics class talked about how essential it is to be accurate and accountable with the material displayed in the news stories. Techniques I learned from the Photojournalism class are used in my photos. Today we went to two classes. The first class was helpful to me because it helped me learn a lot about photography. Something I learned was that if you arrive an hour before the event then you will get better pictures. Later that day we went to the mall. Today we attended two workshops. The workshop I enjoyed and learned the most from was “Photojournalism”. The speaker taught us how to take frame by frame shots from videos, caption sports shots, and produce our own frames. We also learned how capture the right kind combing light into visual awesomeness. After the workshops, Stephanie, Jonay and I took time to enjoy the hot tub while the other girls went shopping. Our day ended around 9 pm. Today is April 12, 2014. We woke up around 7 and we all met up to have breakfast in the hotel. We went to about 4 different workshops. I learned a lot about editing and photography. Later on that day we went to the Gaslamp, which is a place in San Diego with stores and different restaurants. When we got back to the hotel, we went to the pool, then back to our rooms and prepared ourselves for the next day.